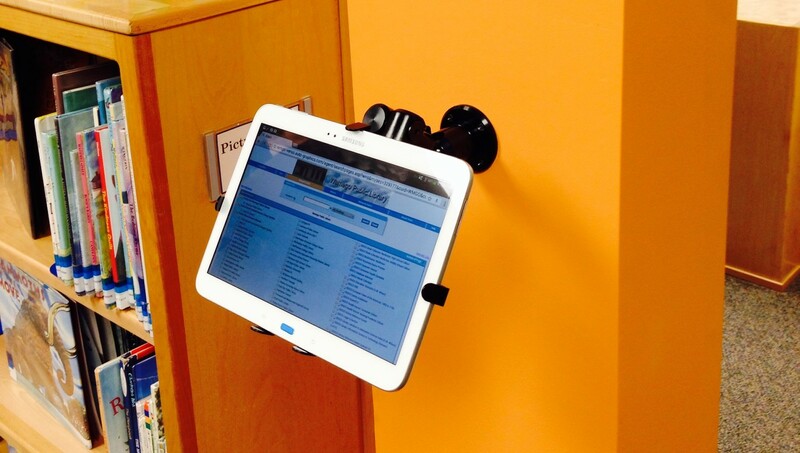 It’s been about a month now since we put up our Tablet Look-Up Station and we still think it’s pretty nifty – and our patrons do too! Kids have adapted to using the tablet easily (maybe too easily!) We thought we had access to apps and settings fairly hidden, but kids figured out waaay faster than we expected how to change the background, play games, dance to music, download apps, and watch YouTube videos. So, we decided we needed an actual parental control app that would put the tablet on lock-down. We only wanted users to have access to our library website and catalog, so we were looking for something that would give us very tight control. We tested four different apps, and found that the Kids Place App in combination with the Kids Safe Browser App best met our needs. 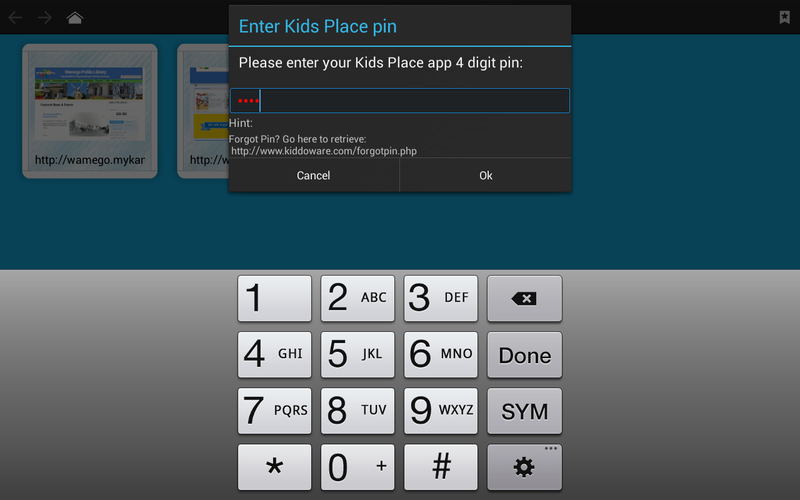 The Kids Place App gives you control over TABLET settings. 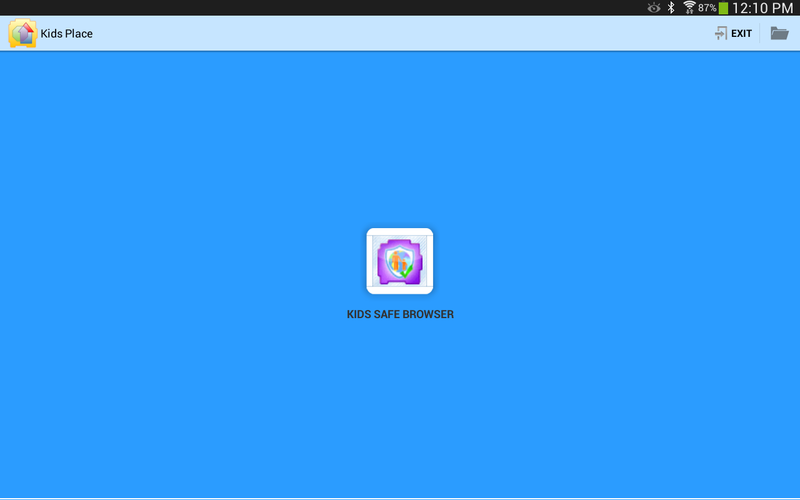 The Kids Safe Browser gives you control over INTERNET access/settings. The Kids Place App allows us to display a custom home screen that only shows apps or links that we allow. This is the home screen on our tablet. It only allows access to the Kids Safe Browser. 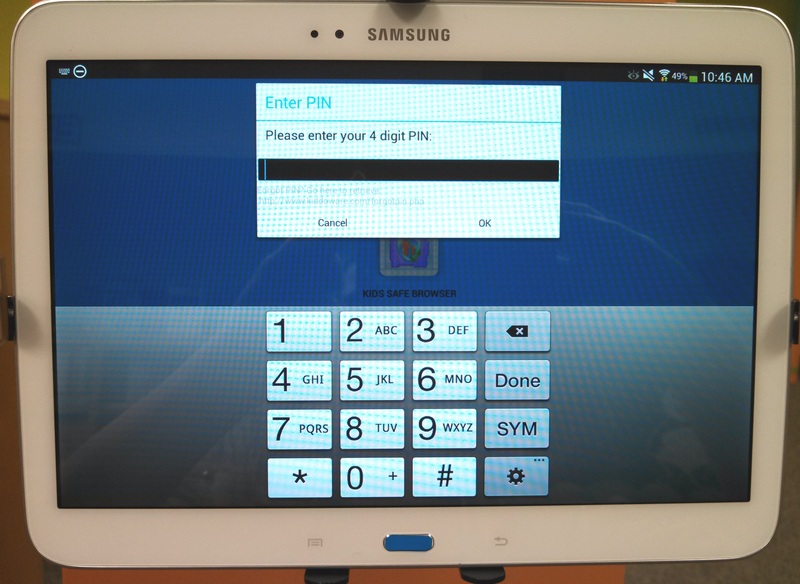 To change any settings, a user must enter the correct pin number. Also, the Kids Place app is free! Once we had the Kids Place App installed, we realized that we also needed control over websites that users could access. This is where the Kids Safe Browser comes into play. It does cost $3.99, but it’s the best we came across. 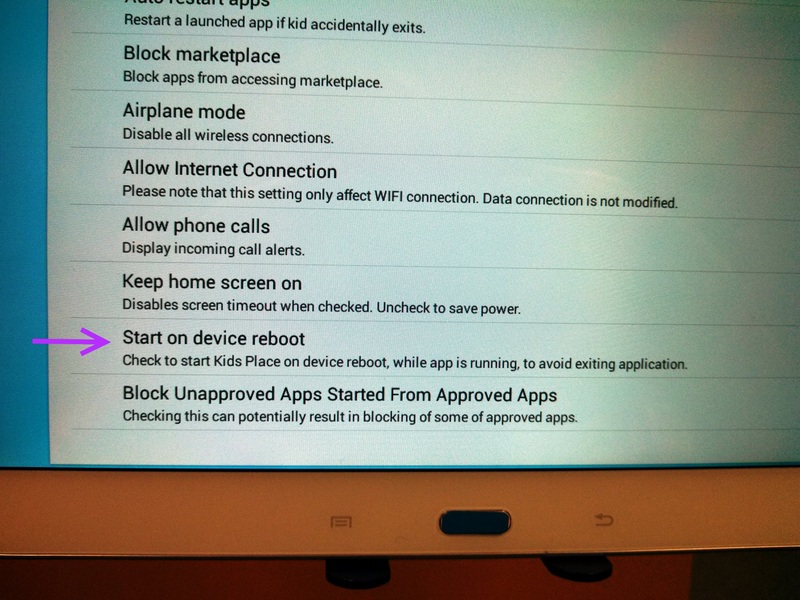 Once downloaded, we chose (in Kids Place) to only show the Kids Safe Browser App on the home screen. This means that the ONLY thing users have access to on the tablet is the Kids Safe Browser. 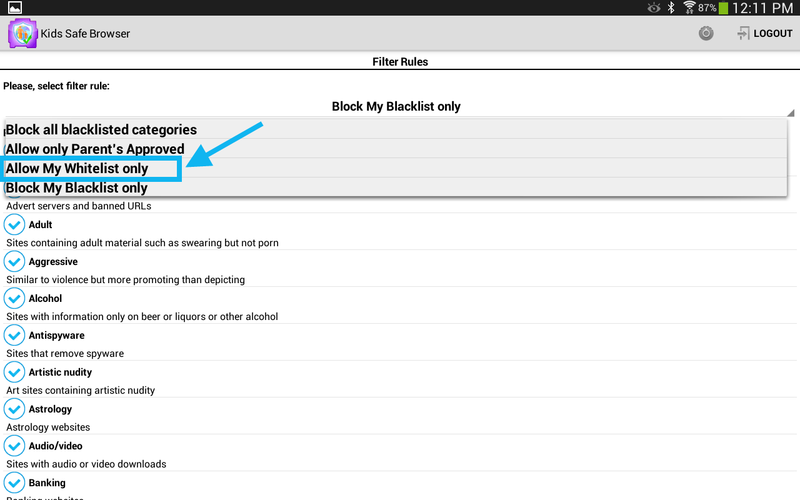 The Kids Safe Browser allows us to choose particular webpages to show – this is called the “White List.” If there are certain pages that you want to block, you can add those to your “Black List.” We chose the option “Allow My Whitelist only” and only allow access to our library website and our library catalog. So far, we’ve got nothing but good things to say about the parental controls. I’m sure that someone will figure out a way around them eventually, but so far we are thwarting YouTube video-watching and Transformer game-playing like rock stars. Of course, we do allow these fun activities on our public internet computers. 🙂 We just want to limit the look-up tablet…to, well, looking up library materials. Although, I can imagine if we had several tablets mounted around the library that had open internet access, we would have groups dancing their hearts out to the latest music trend or cracking up over the newest YouTube video. Can you imagine a children’s library like this? I can see it coming soon……! March 12, 2014 in Library Design & Displays. What mounting equipment did you use?